I had Riley and Ryan with me for Bring Your Child to Work Day yesterday. As I work in hockey, this has become sort of a second Christmas for our family. It’s also among the many, many activities that have gone from being absolutely terrifying to almost routine. Before I brought Ryan for the first time, I went to see our head of HR, who runs the program. I told her about Ryan. I explained how much he wanted to come, but there might be some difficulties. I told her I was only a phone call away and, if needed, I could drop whatever I was doing and take him, or take him home. What she told me boiled down to, “don’t worry. I got this.” She assured me he would be well looked-after and would enjoy himself. She was right, of course. Moments of anxiety were few. Memorable moments were many. I remember him running from cubicle to cubicle, asking surprised co-workers about their favorite NHL teams (usually pretty easy to figure out based on how their desks were decorated). He was thrilled to find so many of “his people” — hockey-loving people — in one place. I’m still hearing about that one years later. There were no such concerns yesterday. I knew Ryan would be fine. 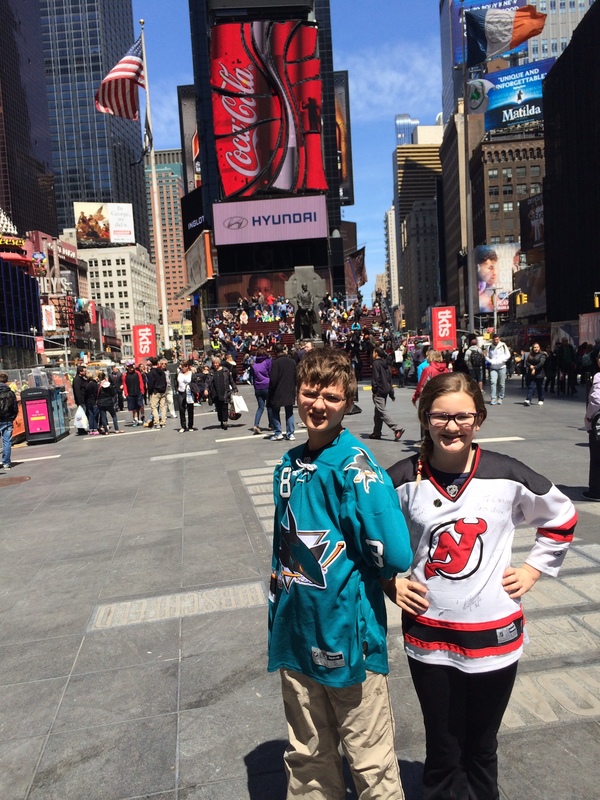 He immediately sought out a couple of other kids in Sharks jerseys, while Riley looked for some fellow Devils fans. The only moments of difficulty the last few times we did this came at lunch. Both my kids have limited diets, with almost nothing in common. Ryan loves pizza, Riley doesn’t even like to be around it. She loves Chinese, he won’t step foot in a Chinese place because of the smells. She could polish off a few New York City “dirty water dogs,” but won’t touch a hamburger. Ryan loves burgers, but a hot dog is abhorrent. You get the idea. Veronica came up with the winning suggestion. She thought a diner would work, and I remembered that there’s one right near my office. We studied the menu the night before. Burgers? Chicken fingers? Check. We were seated and Riley studied the menu before settling on fried chicken. I encouraged Ryan to look through his menu, showing him where the burgers were listed. But he had his eye on something else — Belgian waffles. I pictured his Sharks jersey covered in syrup for the afternoon presentations and tried to talk him out of it. As the server approached, I asked him what he was having. “You’ll find out when I give my order,” he said. This was new. A fierce self-advocacy and demand to be heard. It was another Not Little Thing. It forced me to consider our typical restaurant interactions. Riley speaks to the waiter directly and makes her choice known, while Veronica or I often dictate Ryan’s order. Why? Expedience? Convenience? An assumed lack of interest in Ryan speaking for himself? This post from Jess came immediately to mind, except it was me, not the server, making improper assumptions about Ryan’s desire to speak for himself. The waitress took Riley’s order, then mine. She turned to Ryan. I have noticed that in less-familiar social situations — on the phone, asking a friend to come over, or now, with a waitress (but definitely NOT when speaking to his favorite San Jose Sharks) — Ryan can almost stutter while trying to get his thoughts out — in a way that he doesn’t when speaking to us or in other situations that are more comfortable. He hesitates, starts a sentence, cuts himself off, starts over. This happens a couple of times. To me it feels like it is taking uncomfortably long in this busy restaurant, but our waitress is not bothered. I fight the urge to intervene, but there is no need. In his own way, on his own time frame, He’s. Got. This. I again prepared to intervene. This is clearly a curve ball. And curve balls can fluster Ryan the same way a well-thrown one can make a Major League hitter look silly. Ryan doesn’t give me the chance. For the second time in less than a minute, I have underestimated him. My son has just eyed a big, slow hanging curve ball and crushed it into the upper deck. He answers her questions about sides, making it clear that all he wants is his burger with bacon, the bun, and fries. You can keep your lettuce, tomato, cheese and ketchup, thank you very much. The entire exchange lasted no more than 15 or 20 seconds, but it represented so much progress — and not all his. Ryan’s insistence on being heard. My recognition — finally — that it was important to let him do so. His ability to communicate his needs. His handling a change in plans with barely a blink. And, just like that, another basic human interaction, one that was once difficult, or required (so we thought) parental intervention, has come and gone like it was nothing. It has been filed to the memory bank, both mine and his, so that it will be more familiar next time. These are small things, but they’re never small. You and I know that, right? oh…I have followed your blog for quite some time now. I have a 17 year old son very similar to your son, except he would tell you there are only 2 good thing in the Sharks (Niemi and Burns). I just read this at work and now have tears. So awesome. And welcome! What a precious mother’s day gift. BTW, my son ONLY eats vanilla too. He used to sometimes have sprinkles on it, but not anymore. But, he now eats cones instead of only in bowls. 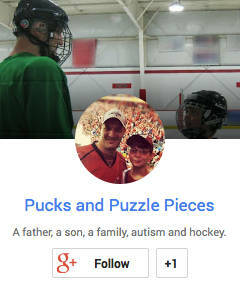 Who does your son root for in the NHL? Fantastic! What a great moment! Way to go! I still have these moments. And I feel proud when I have dared to ask that “silly question” or ordered something (after choosing for 30 minutes or so). Too bad noone is there, or the ones who are there, doesn’t know how big this is for me. It doesn’t make me uncomfortable at all, and it IS a big deal. Thanks for sharing. I have learned to accept that my son’s timelines are his own, and whatever discomfort they cause me — that’s my issue, not his.